Exclusive to InterContinental Ambassadors and Club InterContinental guests, the bespoke print and digital guides are now available in 18 key destinations across Asia-Pacific and the Middle East. 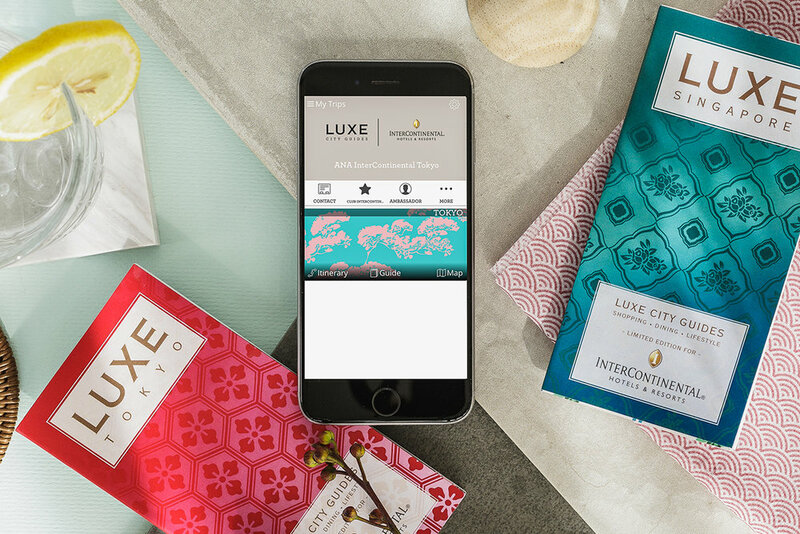 Contained in the co-branded app, the digital guides contain hundreds of dining, shopping, entertainment, spa and wellness recommendations sourced by LUXE’s in-destination experts, in addition to bespoke itineraries, offline maps, geo-notifications and other useful features. For travellers who prefer a physical guide, the co-branded custom print guides are instant collectible items with their colourful covers inspired by each destination, and highly curated content highlighting the best experiences to be found. Customised by LUXE, the guides also contain select points of interest close to each InterContinental Hotels and Resorts property. 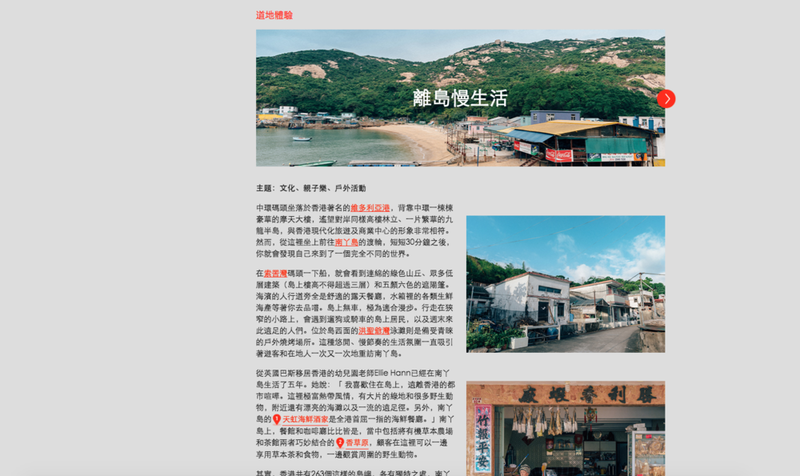 After a couple of years of inactivity, the Hong Kong Tourism Board wanted to revamp their official online Insider’s Guide, covering all 18 Hong Kong districts, and promoting Hong Kong to the world. LUXE City Guides have been engaged to create the new content for the official Tourism Board online guide, including articles for all the 18 districts in 3 languages (English, Simplified Chinese, and Traditional Chinese), on the ground photography, and 5 inspiration videos. TravelPhase and SmartFlyer, two leading travel agencies part of Goldman Travel Group, were looking for innovative ways to provide their clients with curated and constantly-updated destination content. 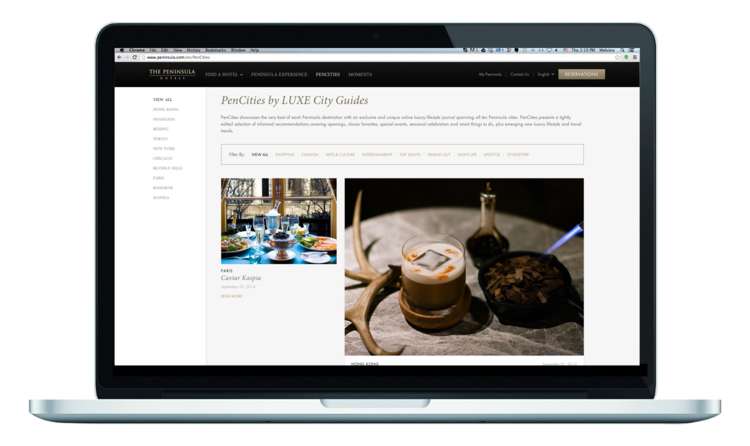 LUXE created a co-branded version of the LUXE Directory for both brands, to be used by the travel consultants to prepare itineraries and list of recommendations for their clients, either before their trip or upon request. In addition to this, LUXE also created co-branded apps for both brands, to be given by to clients upon confirming their booking. The iconic Peninsula Hotels group represents the epitome of old-world elegance, with a timeless, East-meets-West aesthetic and modern sensibilities that attract the world’s most astute luxury lovers. Wanting to further augment their on-the-ground offering to guests, the Peninsula group tapped into our destination expertise to create ‘PenCities’, a journal-style addition to their website, tightly edited to spark the imaginations and whet the appetites of their visitors. Covering hot-off-the-press openings, all-time classics, one-off events and seasonal celebrations, plus emerging lifestyle and travel trends, the hand-picked and lovingly developed PenCities recommendations and content offer rich and varied snapshots of city life to current and future guests alike, all the while showcasing the group’s ten knockout destinations to their greatest advantage. LUXE has created six new stylised amenity kits for the business class passengers of Etihad Airways, inspired by some of the iconic cities on the airline’s extensive global network. The designs for Abu Dhabi, London and Madrid, have been specially produced for Etihad Airways, whilst the Los Angeles, Sydney and Hong Kong kits feature bespoke LUXE artwork. Each kit contains a customised Etihad Airways LUXE City Guide which corresponds to the showcased city, covering everything from hotels and restaurants, to spas, bars, boutiques and bespoke shopping, as well as services, specialists and personal guides. LUXE was approached by luxury cosmetic brand SK-II, part of P&G group, to create inspiring travel itineraries for its VIP Chinese customers travelling to Korea, Japan, Singapore and Thailand. LUXE involved its resident curators in each country to suggest suitable themes and recommendations for sophisticated Chinese travellers. Each itinerary was inclusive of a seasonal introductory theme, a selection of dining, shopping, relaxation, activities recommendations, as well as a shopping list. DFS inaugurated a new exclusive department store in Venice, T Fondaco dei Tedeschi. DFS Marketing team was looking for gift ideas to introduce the new store to all DFS Loyalty program members. LUXE created a bespoke Venice guide, including the beautiful Venice canals landscape on the front cover, and an overview of T Fondaco dei Tedeschi in the first page of the guide. The rest of the guide covers all the best Venice has to offer in the traditional categories of accommodations, dining, bars, spa, shopping, activities, services. The feedback from DFS VIPs customers was very positive and DFS successfully introduced the new store in style with LUXE City Guides. A customised box set with two unique guides both of which featured multiple destinations, LUXE Asia Pacific and LUXE Southeast Asia. Hugo Boss organised a series of events in their Hong Kong shops to introduce the BOSS AW 2016 Travel Line. They wanted to gift each guest with a useful travel application that at the same time could include Hugo Boss branding, shops information and introduce the new collection through pictures and videos. LUXE Concierge app was customised with Hugo Boss branding, and additional Hugo Boss content was added thanks to the custom tabs. Each app was inclusive of 6 complimentary LUXE guides. LUXE team took care of designing the co-branded app following the customer directions and deliver it to all guests right after the events. To celebrate the Year of the Tiger in the Chinese calendar, LUXE launched the limited edition ‘White Tiger Chest’ in 2010 with Shanghai Tang. Each box was handmade and engraved in marquetry, containing 30 fabulous LUXE guides. A Hong Kong guide created exclusively for Veuve Clicquot’s involvement in Hong Kong Art Fair for 2011 and 2012 and was gifted to their VIP clients. This content was also incorporated into LUXE’s existing Hong Kong app. 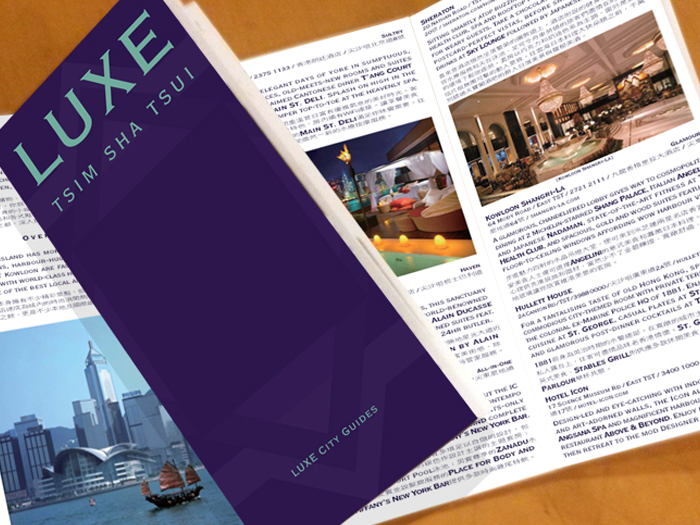 Custom guide was used to promote one of Wheelock’s residential developments, the Grand Austin in the Tsim Sha Tsui region. It includes need-to-know information, destination images and a specially created map. The guide was written in English and simplified Chinese to target offshore investors.